Which came to be first - bigger airplanes, or longer runways? Would making an airport(s) before making the actual airplanes be feasible and cost-efficient ? Will new(and more runway-length demanding) airplanes be able to take-off from shorter runways, because there are no other options ? I'm generally interested in historic terms, which came to be first - bigger airplanes, or longer runways ? The runway required for the aircraft depends on the take-off weight and the lesser runway length restricts the payload or range. As a result, for economical operation, the runway needs to be longer. For large aircraft, the runway (and taxiway) width, apron and parking space are important considerations. In most cases, lengthening the runway will be easier than taking care of these other constraints. In the end, airports have to weigh the benefits of letting heavier aircraft operate against the resources required for runway lengthening. For major airports (like Heathrow, for example), the cost of runway expansion will run into the billions. Unless the aircraft is going to be operated regularly (which depends on how many airports it can land), there is no point in lengthening the runway in an airport. The economic operation of the aircraft has to be considered. For example, the A380 was designed around a 80m 'box', which the airlines had decided is the maximum size they can operate economically. A bigger aircraft does not mean more runway required. For example, the A380 requires (slightly) lesser runway compared to 747-400. If it comes to that, aircraft requiring more runway can takeoff from smaller ones. For example, a Boeing Dreamlifter once took off from a 6000 ft runway (it normally requires > 9000ft). The airports with longest runways have them for different reasons- the Qamdo Bamda Airport (5500m runway) has a long runway due to its elevation (>4300m above MSL), while the Ramenskoye Airport as a long runway (5400m) due to the aircraft operated there; it was a test facility, for among other things, the Soviet Buran spacecraft. The biggest airplanes first used water for taking off and landing, and only later were similarly sized land airplanes built. Bigger airplanes tend to have a higher wing loading and so require longer runways. The Caproni Ca.60 was the biggest aircraft of its time (1921) and is still bigger than a Jumbo Jet if you use wing area to measure size. It could only be built as a flying boat. Another biggest aircraft of its time was the Dornier Do-X from 1929. On one occasion it carried 169 people into the air, including one stowaway. Its regular capacity of 60 to 100 passengers would only be surpassed in the jet age. Dornier Do-X in flight (picture source). This one actually flew, but was hampered by the small aircraft engines which were available at its time. 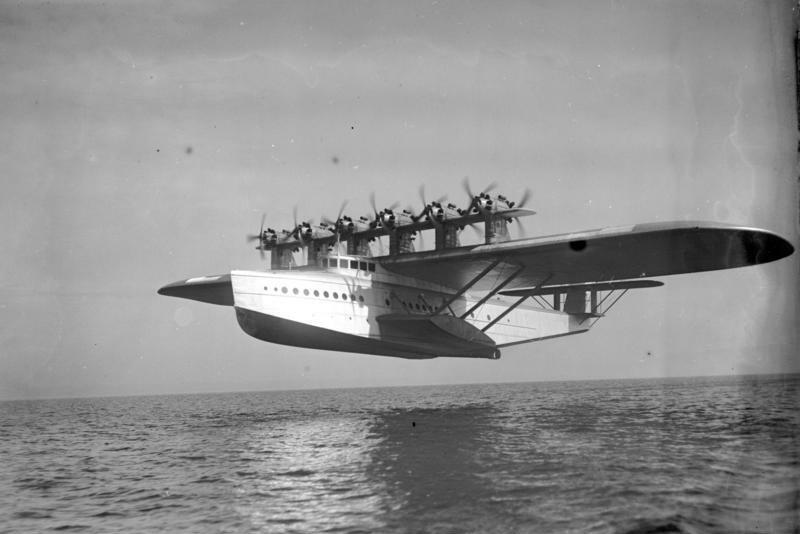 Flying boats were also used on the first transatlantic and transpacific routes, and to connect the parts of the British Empire by air, Imperial Airways used a fleet of floatplanes and flying boats. Routes were strung along lakes as staging points. Long runways were only built during the second World War when the weight and speed advantage of land airplanes made them the preferred choice for bombers. With the runways in place, flying boats soon disappeared. The bigger airplanes came first. A shortish runway length is not preventing bigger planes to operate, but it limits the take-off weight, especially in warm weather. Since a lower take-off weight means less payload, the business case to extend runways became obvious. So airports follow suit. Not the answer you're looking for? Browse other questions tagged airliner aviation-history runways or ask your own question. Is the airport capacity related to number of runways? Which civilian airport has the most runways (current and planned)? Why are fast passenger airplanes no longer produced? What is the origin of the practice of numbering runways by magnetic heading? When was trim on airplanes used for the first time? Which was the first pressurized aircraft? Is there a way for passengers to know which runways their flight will use?